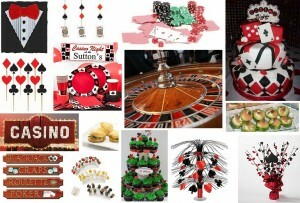 Casino-themed parties are becoming an increasingly popular idea for parties! If you have been given the task of organizing a casino party, then the following these casino party ideas will benefit you greatly. I am sure that these ideas will be a hit this holiday season! There are casino parties where there is no actual gambling involved. You can hand out play money to use for betting. Even though you are playing for fun and not money, you can still make things interesting and exciting for your guests by offering prizes at the end of the event to the winners. For a small casino party at home, this can be something as simple as a trophy, a medal or a certificate (or a gift). For a larger casino party like a corporate or a fundraising event, larger and multiple prizes are more appropriate. PartyCasino.com can also be used as an online game tool where small fun bets can be placed. You can also opt to hire a casino dealer for your casino party. o Blackjack, Craps, Roulette, Poker, Texas Holdâ€™em â€“ all your favorite casino party games! o Dealers for 3 hours â€“ Choice of dealer themed dress. Choose the right food and drink. If youâ€™re catering to an all-adult crowd, then the drinks should represent a â€œswinging,â€ feel good attitude. Martinis and Cosmopolitans both have that special Vegas-feel, and as for feeding your guests, be sure to choose finger foods thatâ€™s not too greasy and is easy to eat while playing the games on the floor. A fun way for your guests to remember the evening is with a nice little token that everyone can take home with them. You can get customized poker chips, shot glasses, or t-shirts made just for the event. If your crowd of friends love doing poker nights, you can spruce up your usual nights with these ideas! What kind of parties do you throw for your friends? This entry was posted in Party Ideas, Slice of Life by admin. Bookmark the permalink.